Almost two decades ago some friends and I discovered an eco-tour of the lower St. Lawrence Seaway on a boat named ‘Echo de Mers’ – a name chosen partially because it was a converted Coast Guard cutter into which the owner had breathed new life and a new purpose. Her primary catch-phrase and mission statement was a version of a sentiment often attributed to Jacques Cousteau: “We protect what we love, and we love what we know.” So her mission was to take groups of 40 or so on an intimate journey along the coast of the St. Lawrence to help them learn at close hand about many of the ecosystems along the way. The learning was facilitated by subject matter experts in the areas of whales, birds, biology and geology. It was a particularly effective approach. For the past 5 years Ecologos and our partners at Learning for a Sustainable Future have been offering our own version of this work and approach in the program we call Water Docs @ School Action Projects. The program grows each year, consistently garnering excited reactions from teachers and students alike (how can you lose with that kind of success?) and we’re looking forward to another 7 months of learning by doing. The program is designed and anchored around the Ontario Grade 8 curriculum, but teachers of combined Grade 7/8 classes have found that it works equally well for the Grade 7’s. Students reflect on their experience of both the classroom learning and the selection and execution of their class's Action Project and the associated documentary. · Learning – inquiry-based, student-focused lesson plans deliver the entire Grade 8 unit on water; students learn about watersheds, including their own, and the importance of protection and conservation. · Action – The class is invited to examine their local community, and to identify a water-related issue which they could address as a class. They should be able to quantify the problem, create an Action Project to address it, and measure the impact of their work. · Filming – While pursuing their Action Project, students simultaneously create a short documentary film about the issue, their solution, and the results they’ve achieved. · Celebration! 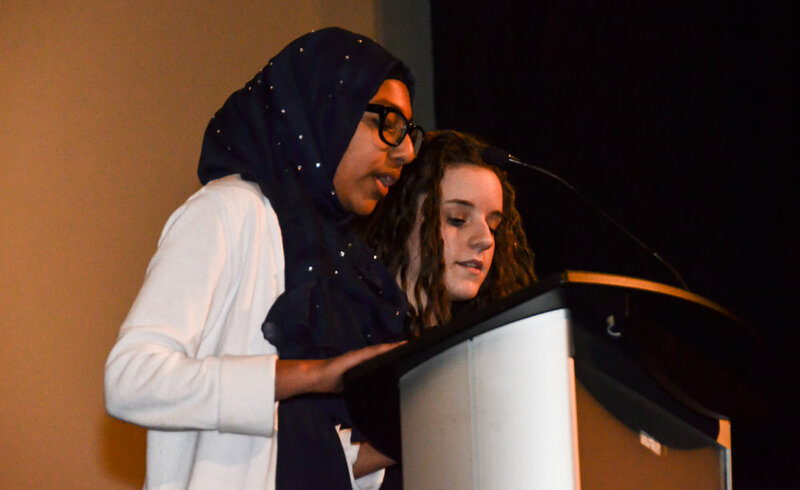 – In the spring, classes gather for a celebration of all they’ve learned, their projects and their films. Keynote speakers share their own experiences, and students are able to watch the winning films on a large commercial screen. Prizes are awarded for the Best Project and the Best Film; these are usually equipment that will help future classes with their own projects and documentaries. See highlights from the 2018 Water Docs @ School classes in the video below! All these resources and the associated support from LSF and Ecologos are entirely free to the teacher and to the school. Teachers love the program because it’s classroom-ready, it’s free, but mostly because the students love it. Students love it because it’s student-centred – they get to choose the action project, decide how to research and address the issue, and exercise their own creativity throughout the making of their film – and because they learn that their voices can indeed make a difference. If you’re a Grade 8 or Grade 7 teacher, feel free to register for one of our informational webinars in August or September. Or, if you know any teachers, please let them know about this exciting opportunity. Registration for the program is now open and it closes on September 30, 2018.